The Corbetts can be climbed at any time of year, but this guide assumes readers are climbing when the hills are free of snow. Many of the Corbetts are rarely climbed which means that often the only paths are animal tracks. This does mean that the going can be relatively tough and navigation can be demanding in mist. 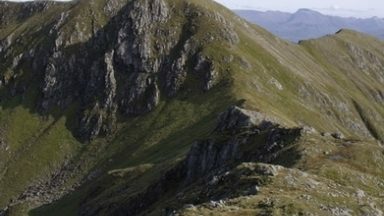 Very few of the Corbetts in this volume involve any scrambling, but many involve ascents and descents on steep slopes. The Corbetts – Scotland’s mountains between 2500 and 2999ft in height – are less visited but in most cases more accessible than the ever-popular Munros, and frequently offer better views when the 3000ers are shrouded in cloud. Their lower altitude also means the walks tend to be shorter meaning they can be tackled easily between breakfast and dinner and during the short daylight hours in winter. However, many of the Corbetts are very remote from road access and will still give a demanding hike. 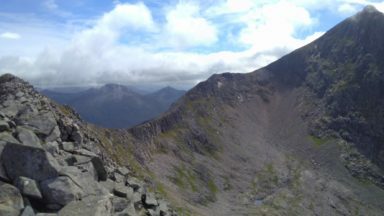 What is more, between many of the peaks listed as Munros, there is little drop, so you can often climb several in one day. By contrast, the requirement for a 500ft drop on all sides between listed Corbetts means that there are few occasions where Corbetts can be linked together. Subsidiary summits of Munros and Corbetts between 2500 and 2999ft high with a drop of at least 30m on all sides are known as Corbett Tops. 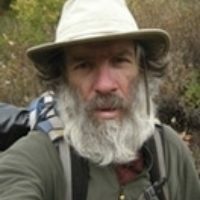 The 1:100,000 maps in this guide are good for planning purposes and will give you a general idea of the route, but they don’t give enough detail for accurate navigation in difficult conditions. For this reason it is essential that you carry the relevant maps. The Ordnance Survey (OS) 1:50,000 maps, available in paper form or for GPS devices, are very good and should be all you need to follow the recommended routes. In popular areas updated OS 1:25,000 maps are available but not really necessary. Probably the best maps are the Harvey maps (mainly 1:40,000) but they don’t have full coverage of the Scottish Highlands. The contour lines on all of these maps are remarkably accurate and should be seen as your main navigational tool. Inexperienced walkers going out in good visibility should learn to relate contours to the ground so they are better prepared if they get caught out in mist. You should always carry a good compass (those produced for orienteering by Silva and Suunto are probably the best). In good visibility it should be sufficient to use the compass to orientate the map, so that north on the map lines up with north on the ground. At present, magnetic north is near enough to grid north not to have to adjust for magnetic variation. Learn to take bearings from a map and follow them using the compass in clear conditions, before you find yourself having to navigate in mist. The most difficult thing in navigation is knowing how far you have travelled, which can be important when navigating in mist on Scottish hills. In extreme conditions it may be necessary to pace-count to measure distance – practise this skill in good conditions, so that you are prepared. Probably the most common navigational error is to head in the wrong direction when leaving a mountain summit. It is a good habit to always check your compass when leaving a mountain summit, even in clear conditions. If you are experienced at using map and compass, a GPS device is not essential for navigating the Corbetts. However, even experienced mountain navigators will find it can make navigation easier in mist and the less experienced might find that using a GPS device allows them to navigate safely in poor visibility. Following a survey by John Barnard and Graham Jackson, Cnoc Coinnich has been upgraded from Graham to Corbett status. The new height has been accepted by the Scottish Mountaineering Club, the guardians of the tables, and by the Ordnance Survey. Cnoc Coinnich (NN 22346 00772): Formerly 761m, now 764m. 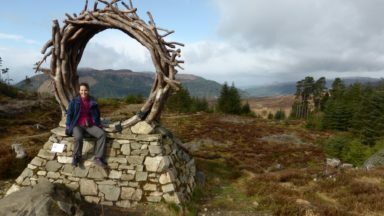 It is situated about 3km E of Lochgoilhead which provides the easiest approach to the mountain. 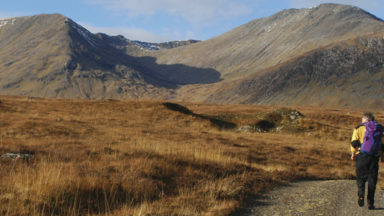 It is joined to the Brack by a saddle at about 476m and a strong walker could combine it with Ben Donich and The Brack using the route described in the Route 12 of the guide. 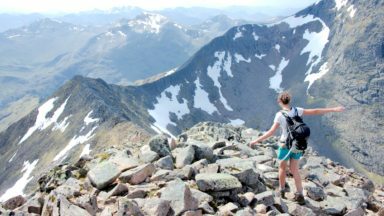 ...This is an excellent guide and would be very useful for both the casual hillwalker visiting Scotland for the first time and the serious Munro bagger looking to broaden his (or her) horizons. 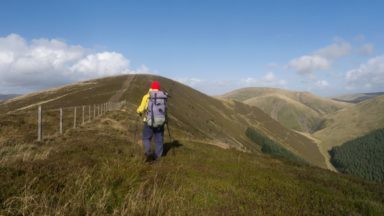 …the guide is as much about exploring the glens as it is about climbing the peaks. The guide achieves Cicerone’s usual high standard of presentation, with helpful maps and plenty of photographs to whet the appetite.